Washington (CNN) - Republicans seized on a news report Tuesday that raised questions about whether one of the Democrats’ most vulnerable senators up for re-election actually resides in the state she represents. 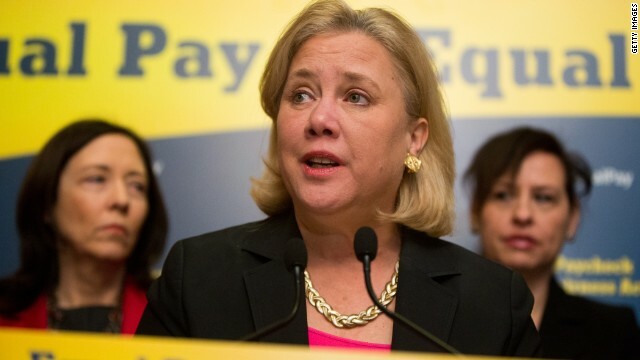 The Washington Post said Sen. Mary Landrieu doesn’t own her own house in Louisiana. The paper said she listed her home address on a recent campaign filing with the Federal Election Commission as being her house on Capitol Hill in Washington, which the Post said is valued at $2.5 million. But the paper said when she was qualifying for the ballot in Louisiana she listed the house where she was raised in New Orleans, where her parents still live. In a statement issued by her campaign, the senator dismissed the story. “I have lived at my home on Prieur Street most of my life and I live there now, when not fulfilling my duties in Washington or serving constituents across the state,” she said. A campaign aide added that Landrieu and her husband both vote and file taxes in Louisiana and that the D.C. address listed on the FEC filing was just a mailing address. The aide said Landrieu has used the Prieur Street address for her qualifying documents for the past few elections. The question of home state residency has hurt other senate candidates recently. Former Sen. Richard Lugar, R-Indiana, lost his seat in the last election cycle after it was revealed he lived in McLean, Virginia, not in the Hoosier state. Similar questions were raised about Sen. Pat Roberts, R-Kansas, this year although he was able to win his primary and is expected to be re-elected. The Post said the Prieur Street house is owned by Landrieu and her eight siblings in a limited liability partnership for estate planning purposes. It also said Landrieu owns other undeveloped plots of land in the New Orleans area. Well, yes, this is a lot of huffing many *years* after the fact of her building that very expensive, large custom home in DC–I was surprised at the time that no one caught a whiff of it and ran with it, because it's been more than a decade and it's a prominent, gorgeous home. That home has also become the "home field" for big DNC fund raisers in the DC area. It seems like the argument the Washington Post is making against here is that she does not own the house she resides in in Louisiana. So does that mean the Washington Post believes everyone that is a renter shouldn't be able to hold public office because they don't own their home? Did you actually read the story before commenting? The point is that not only doesn't she own or rent a place in her home state in which she dwells, she doesn't even stay at the place she listed as her residence. Why should these standards be applied to Republicans but Democrats are allowed to get a pass on them? So by these standards, anybody could own property, in any state, and then claim to be a resident there, even though they don't actually live there. In this case, the house is an investment property, NOT her residence. It must be said, em, your FACTS regarding unions were 100% wrong, but you knew that huh? You have truly lost your ability to judge evenly or fairly, when you believe every BS story from that one place, you wind up sounding foolish, and you seem to excel in that context. Just saying, you state facts, with no basis in reality, where's your source, where's your proof, same place your party is, swirling down the crapper! And Hillary's calf's once looked like she was carrying bails across the border, just think how hard she could squeeze you, who's your mama? Just because you believe, and are thrilled that there is a political party that supports your BS, does not make it fact, you have zero credibility for a reason, but, you knew that too. Rudy NYC, so if you have one or more places you claim to live, you can be elected senator in multiple states. Have you forgotten the Louisiana purchase, guess that means she cares for HER home state. It must be said, how did you like the wall street article on nanny states, too funny right? All gunderson does is whine about them, and tries very hard yo convince people its the lazy Democratic states, you guys kill me, I mean the wall street journal is now a liberal media news outlet, priceless. Oh, and Dean, you might want to see someone about the delusions your experiencing, bwah ha ha!!! excuse my rant, read, she and her 8 siblings own the house for estate planning. It seems like the argument the Washington Post is making against here is that she does not own the house she resides in in Louisiana. If you read the Washington Post article, it is the neighbors who say she isn't a "permanent" resident of that family partnership home. There is also the question of whether or not this double hearsay is even worthy of the neighborly gossip CNN is pushing. While running for president, Mitt Romney's legal residence was the basement of one of his sons home. I suspect when push came to shove, folks accepted that as his legal residence and voted for him regardless. He held no public office and thus wasn't required to spend time living in Washington D.C. as our senators are required to do. But, whatever. The grippers are going to gripe. Sounds like Hillary. Looking at the picture it does bring up the question Are all the Democratic Senators "chubby"? Why is it that republicants always judge women on their appearance instead of their intelligence and abilities? Sounds like Hillary. Looking at the picture it does bring up the question Are all the Democratic Senators “chubby”? Depends on what you consider chubby. Are all GOPT women shrieking, idiotic harpies? Marty must not be from Florida. The vast majority of our republicant female elected officials are shrill, fat, blonde loudmouths who don't have two active brain cells between them! Not a big fan of hers, but her Louisiana roots and legitimacy are beyond solid. Total BS call. Right....live in New Orleans your entire life, get elected Senator, go to DC to do your job, maintain a new residence in DC so you can do your job, file and pay taxes in LA, vote in LA, but suddenly you're no longer a resident of LA? Frickin nonsense. Only the undereducated, misinformed fools in the GOP/Teatroll base would believe idiocy this rank. Apparently, GOPers/Teatrolls think that in order to be a Senator, you either have to (a) commute daily from your home state to DC in order to maintain residency status in your home state and/or (b) be both wealthy enough to afford a home in both your home state and DC and stupid enough to waste your money on having both when they're not needed. "questions were raised about Sen. Pat Roberts, R-Kansas, "
Different. He uses addresses from two DONORS, not his PARENTS' residence. The former looks a whole lot more like a ruse than the latter, which doesn't look like that at all. After watching cross fire some time back, Bachman and Rangle were on, she was unbelievably obnoxious, rude interrupted continuously, and could only repeat two gop talking points regardless if the question she only had the same garbage to repeat, old Charlie was wise enough to let her go, even called her beautiful, and man did that put her vanity on full display, I find her repulsive, on so many levels, much like Palin, in it for them, and no one else period. "Why is it that republicants always judge women on their appearance instead of their intelligence and abilities?" Because they lack the intelligence and abilities themselves and therefore feel very threatened by women who have them in spades. Thank you Yolanda, now you see rwnj that's how you earn credibility and no other way. I don't often fawn over Hillary, but I just can't vote for eliminating my ss, and Medicaid, not to put more money in the pockets of the 1%, just how I see it, I have voted Republican before, and I have watched fox news, that made me look dumb, after a little research on their claims, well it didn't take long to turn that crap off, no MSNBC either. What to her taxes say about her primary residence? How many people are taking tax credits for that residence? Where is the IRS, too busy shredding hard drives??? Isn't she and her parents really saying she's a boomerang – she failed to launch – never left home? "What to her taxes say about her primary residence? " She and her husband pay the Louisiana state taxes. Exactly. The woman has lived there her entire life. It's not like she rented a motel room and is using it as her residence. I refer you to the unusual case of Scott Brown, a Republican from Massachusetts and New Hampshire. Look, Republicans tried to run this rant six years ago, and it failed then. While most people outside of Louisiana may not know how deep her roots run in the state, the people of Louisiana do know that her family has been there for generations. not so dumbed down....I believe "voluntary" by the owners was similar to being barefoot and strapped to a chair. The unions , with their ballpeen hammer, smashed the little toe first and then asked the owner to reconsider his decision. Technically the decision was his and it was voluntary but you can get the picture, right? It was a summer job to put myself through school. Quit school to work full time, then saw the writing on the wall and decided to be in charge of my future rather than beholden to anybody else as to if I worked ,or not. All one has to do today to see the union mentality at work is follow the Machinists Union in Washington State when they deal with Boeing. A video of "strikers" is worth a million words. She is a fraud, like most Democrats. The FACT is she and her family do NOT live in Louisiana. If they do not maintain an apartment or a house where they live when in the state, then they are VISITORS to the state. They VISIT her parents. Let's see her hotel receipts when she is there. I'll bet she stays in hotels every single time and NEVER at her "residence".